The Chinese government has made clear that it intends to despatch a small number of warships to the Gulf of Aden to join naval vessels from other countries there to combat piracy. Full details of the Chinese naval deployment have not yet been released but indications are that perhaps two warships and a supply vessel will join US, Russian, Indian and European ships already operating to protect merchant vessels in the waters. This is a significant first for China, both strategically and diplomatically. China's navy has tended to operate relatively close to its home ports. This will be its first active deployment beyond the Pacific. Naval analysts will be watching closely to see how the Chinese cope with the complex maintenance and re-supply problems of operating so far from home. They will also be watching to see how the Chinese ships and their crews adapt to their mission in a busy waterway, alongside warships from several other countries. 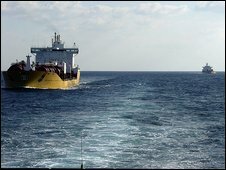 China joins a growing international presence in the region - the core of which is the European Union's first maritime operation. It is not yet clear how the Chinese flotilla will operate alongside other warships or how far procedures will be harmonised. As more and more countries contribute to the operation, so there will be a growing need for real co-operation so as to best use the resources available in what remains a huge expanse of water off the Somali coast. China's chief concern is economic. The Gulf of Aden is a region of key strategic importance for China, whose growing economy depends heavily upon a secure supply of oil and raw materials from abroad. Some 60% of China's oil comes from the Middle East - much of it through this waterway and it is also an important route for shipments from Africa. 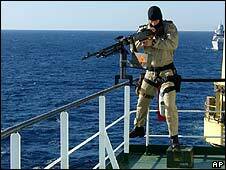 Chinese merchant ships have already been attacked by pirates. One - owned by the China Communications Construction company - was attacked only this week off the coast of Somalia. So this deployment is a logical step, indicative of China's growing concerns. But it also sends a powerful signal that China is slowly but surely beginning to consider a more expansive role in global security. This is precisely the sort of step that the United States for example will welcome; a sign that, as the Americans put it, China is becoming a responsible stake-holder in the international system. But not everyone will see things in this light. A Chinese navy capable of extended operations far from its own bases will cause unease among many of Beijing's maritime neighbours. And it will only reinforce calls from those who argue that the best security against a rising China is to tie Beijing firmly into the broader system of international norms and regulations that make up the global community.